Junior Santiago Medina remembers feeling frightened as he ran into some intense soccer hooligans – what South Americans call barra bravas – after a World Cup match-up between Argentina and South Korea in 2010. “We got pushed around – it was a bit scary, but once everyone with the drums and the trumpets left, it was fine,” Medina said. Medina has lived in Indonesia and South Africa, but his extended family hails from Argentina and he tries to spend some time there every year. As such, he is very familiar with the soccer culture in Argentina. The fans can be very passionate, as he experienced at the World Cup match in South Africa. Medina tries to embody the positive components of being a passionate fan. He supports Boca Juniors, a team in Argentina’s biggest league, the Superliga. Hailing from La Boca, a neighborhood of Buenos Aires, the team has a storied history with crosstown rivals River Plate. Boca was the first club of Argentinian soccer legend Diego Maradona and River hold a record 36 titles in the Superliga. The history behind the Boca-River rivalry has led to it being labelled as the biggest club rivalry in the world by multiple publications. This deeply rooted passion for the sport has led to numerous incidents between fans of both sides. Three years ago, when Boca and River played in South America’s biggest tournament, the Copa Libertadores, a Boca fan released pepper spray in the player’s tunnel, affecting multiple River players and giving them the win by forfeit. This happened in a Round of 16 game. This year, Boca and River faced off in the Copa Libertadores championship game, increasing the potential for a violent event to happen. Under such high stakes, the eyes of the world were on Argentina, which encouraged Medina, as many more people would get to learn about South America’s soccer culture. The teams were originally scheduled to play two games to determine the championship: one in Boca’s stadium, one in River’s stadium. The Superliga refuses to allow fans of the opposition at any league game, for fear of security issues between the fans. So, the atmosphere at Boca’s historic stadium – and throughout Buenos Aires – was at a fever pitch and filled with Boca fans when the first match was played on Nov. 11. Senior Maria Lino was studying abroad as part of Knox’s Spanish program in Buenos Aires and was in the city in the program’s final days during the first match. Lino and her friends in the Knox program were near the neighborhood of La Boca during the afternoon game. Lino learned about the rivalry from her culture class and her host family. She had initially wanted to see the historic matchup, but soon learned about the restrictions to home fans and security concerns. “You can’t attend, you literally can’t buy a ticket, because they want to protect you or something – we actually wanted to go, since we were gonna be there for the match, but we couldn’t go,” Lino said. Lino also noted that one Boca-River match in September – a simple regular season match – made her neighborhood so loud that she couldn’t sleep. Despite the abundance of noise, Medina hopes that the Knox students in Buenos Aires experienced something that they will never forget. Medina watched the game on campus with friends on Knox’s soccer team and was happy to see his team on the world stage. Boca and River played to a 2-2 draw during the first leg of the championship, meaning that the second leg would decide the winner. The rivalry’s fierceness manifested itself more negatively on Nov. 24, when the deciding match was meant to be played at River Plate’s stadium. The Boca team bus was on its way to the stadium when a group of River fans threw rocks at the bus, breaking many of its windows. The police released tear gas in an effort to control the situation, but this had the unintended effect of seeping into the bus and harming the Boca players as well. Medina and many other Argentinians have speculated that nefarious groups – perhaps even paid criminals – were responsible for the violence in an effort to intimidate Boca. After an initial postponement of one day, the organization hosting the Copa Libertadores decided to host the Boca-River match in Spain at the Bernabeu, a renowned stadium in Madrid. This decision had a very mixed reception. On the one hand, the game was able to harness a more global audience, but on the other hand, it was not held where the real fans were likely to see it in person. While Medina agrees that the game needed to be moved, he feels that the decision to have it in Madrid did not have the fans in mind. 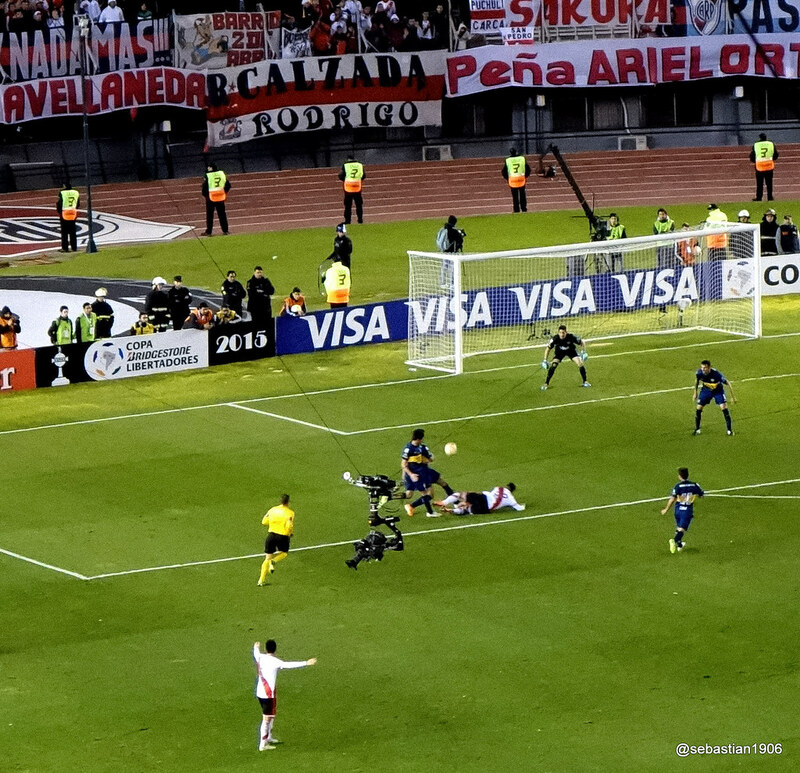 The game was played on Dec. 9 under a crowd that had as many River fans as Boca fans, as well as many soccer neutrals eager for a great game. The two teams delivered the drama as the game went into overtime after 90 minutes. River Plate went on to secure two late goals and win their fourth Copa Libertadores championship with a final score of 3-1. With River likely holding the bragging rights for many years to come, Medina and other Boca fans can only hope to bounce back from the defeat with a response in the league and in future Copa Libertadores tournaments. “I think we need to win the next [Superliga title]. It won’t erase what happened, but it’s a response,” Medina said. After there was so much trouble just to have the second leg of the championship be played, many are simply hoping for beneficial change in the soccer culture of Argentina. As it stands, the barra bravas still hold a great amount of influence and games are missing the atmosphere of having two separate groups of fans.